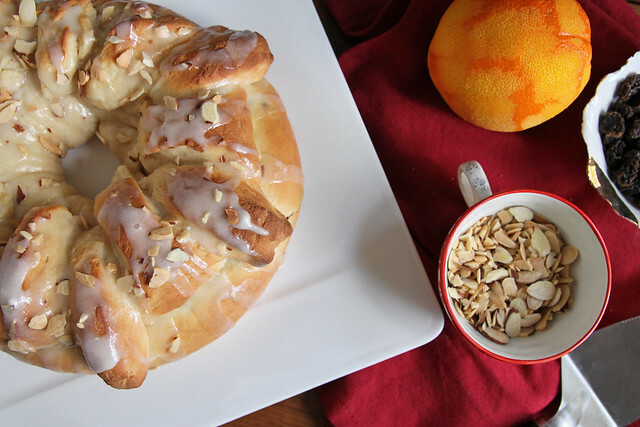 Raisin-Filled Holiday Ring is flavored with cinnamon, orange and almonds for the perfect Christmas morning breakfast. I should be packing right now. I should be throwing everything I own into any box I see. I should be a whirling dervish of packing prowess. This will be our first Christmas in our own home, not spending it shuttling around from location to location. We won’t have a tree or really any decorations to speak of up, but it will be special nonetheless. We will do presents and big family dinners on different days, so Christmas day we plan to have our parents over for something of a housewarming dinner. I am contemplating making this Wine-Braised Oxtail recipe that I made for Alex and I this past Valentine’s day and serving it over polenta. Possibly Julia Child’s Beef Bourguignon. Haven’t decided yet. Either way, I’ll be sure to start the day on a sweet note with a lovely breakfast. If you’re planning to do the same (and who doesn’t on Christmas morning? ), I highly recommend this recipe. It is an impressive bread that will have your family oooh-ing and ahh-ing about how fabulous you are. The assembly takes a bit of work, but I’m ok with that when making the dough is incredibly easy (and it always is when we use our favorite Red Star Yeast). When I made this, I sent leftovers to work with Alex and there was hardly a speck of glaze left on the plate when he brought it home that evening. 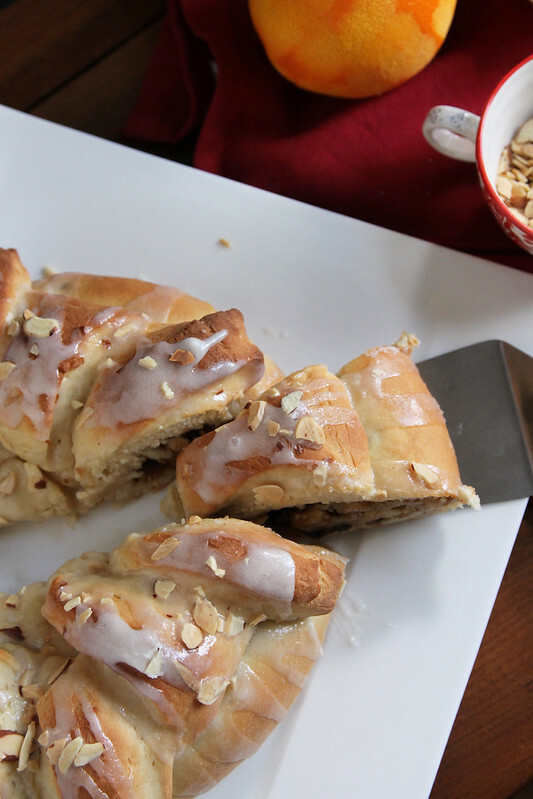 Between the sweet glaze, the crunchy toasted almonds and the filling stuffed with our favorite holiday flavors (raisins, orange, cinnamon and more almonds), I am guessing you’ll experience the same reaction. Just make sure you snag yourself a piece before they’re all gone. 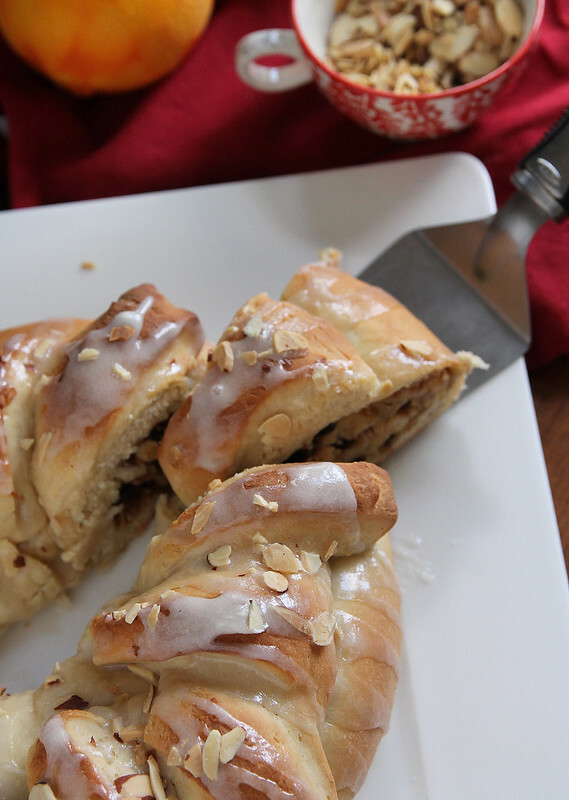 Head over to Red Star Yeast to grab this Raisin-Filled Holiday Ring recipe. awwww your Christmas sounds like it’s going to be lovely! I hope everything with the move goes smoothly! and this ring is gorgeous and looks delicious! I can just imagine how fantastic it smells! I just now found this recipe and site and I was thinking.. heck I’m not waiting until December! ;o) Sounds delicious, like something my Mom made when my Sisters and I were growing up. She taught up so much about baking, cooking, cleaning, manners. One afternoon I came home from school after learning how to make Creme Puffs in Home Ec Class (do they still teach that? They should! We all learned so much in that class) and casually asked my Dad: “Dad, would you like some cream puffs?” He said: “Sure! You know how to make them? !” So I whipped them up and for 7th grade I look back and that was pretty darn cool that I could make them. They aren’t hard but when you’re in Jr. high who whips up a batch of them? Always, always always, cherish you parents, siblings and above all your Sisters because when you lose one life changes and it’s never the same again. Then there was 4….and now I have the best 3 Sisters ever possible! Except I usually say I have 4 because I do, she’s always be in my heart. BTW.. I think chocolate chunks in the pastry ring,would be delicious… I blame Lisa… I read her post up above “Chocolate Meets Strawberry” and it came to mind! i have a sour dough starter which you feed each week w water..instant potato flakes and sugar. 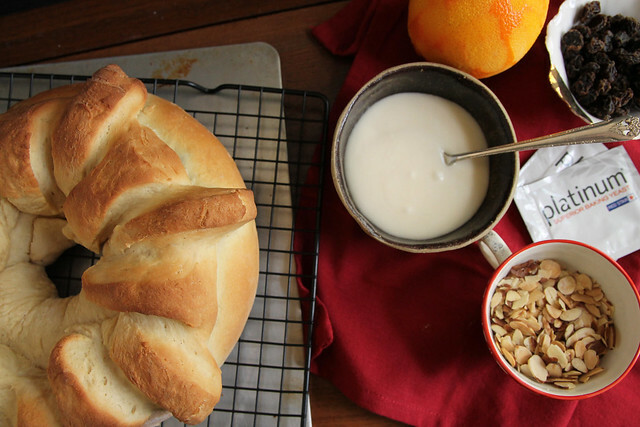 it makes a delicious bread but do you have any more recipes for it?